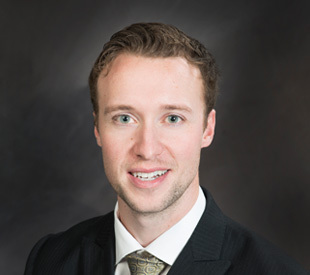 Brett has been with the firm since 2014 and became a partner of the firm in 2018. Brett has a practice primarily focused on residential and commercial real estate transactions, corporate setup and restructuring, commercial business transactions and estate planning and administration. After graduating high school in Red Deer, Brett took some time off to pursue his athletic goals in the Saskatchewan Junior A Hockey League. Brett later earned a hockey scholarship to continue his athletic and academic pursuits in the United States. After attaining a Bachelor of Business Administration Degree from Mount Royal University in 2011, Brett attended Cardiff University where he graduated with a Bachelor of Laws degree in 2014. Being born and raised in Red Deer, Brett looks forward to maintaining his strong connection to the community. Brett is a board member on the board of directors for Habitat for Humanity Red Deer and volunteers as a coach with Red Deer Minor Hockey. Brett enjoys spending his free time playing hockey, golf, water skiing and spending time with friends and family. Brett welcomes the opportunity to meet new clients.